Image caption Caden was described as "an amazing little boy who will be sorely missed by everyone who knew him"
A six-year-old Lanarkshire schoolboy whose battle with a life-threatening blood disease had attracted the attention of people around the world has died. 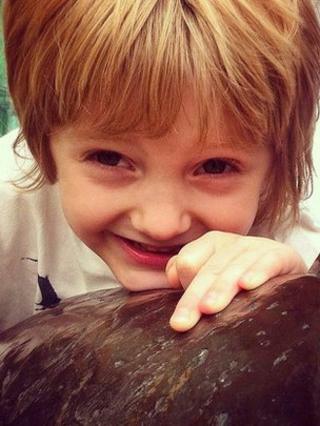 Caden Beggan, from Cleland, died at the Royal Hospital for Sick Children in Glasgow. A Facebook page, set up by his parents to chart his progress, has more than 30,000 followers. A bus had also been painted pink in his honour. A message posted on the Caden Beggan Facebook site said: "Caden Riley Beggan. Born 29th September, 2006. Died 20th November, 2012 in Mummy and Daddy's arms. "Thank you for all your support. Caden is alive forevermore." The six-year-old was admitted to hospital last month after contracting meningococcal septicaemia. He had undergone several operations and had both legs and his left hand removed in a bid to increase his chances of survival. Messages of support and prayers were sent from people around the world after his parents, David and Angela, set up the Facebook page to keep friends and family up-to-date on his condition. Caden was a pupil at Ladywell Primary in Motherwell. Head teacher Pat Ashworth said: "The whole school is terribly shocked and upset at Caden's tragic death. "He was an amazing little boy who will be sorely missed by everyone who knew him and the many thousands of people who followed his struggle on Facebook. "To see him lose such a hard fought battle is heartbreaking and our thoughts are with his family and friends." She added: "We are very grateful to everyone for the support they have shown both to Ladywell Primary School and the Beggan family. "Breaking this sad news to our children will be very difficult and will be handled as sensitively as possible."